Ever wanted to golf in style? Well, take a look at the Damier Geante Golf bag by Louis Vuitton. The bag delivers the true impression of wealthy and style. The bag features a zip-up hood, a number of pockets, a rolling travel cover, removable base and shoulder strap, and even an Umbrella to be used during unexpected showers. 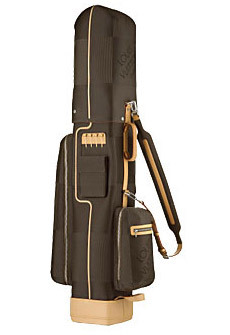 The Louis Vuitton Geant Golf bag is claimed to be the most expensive golf bag in the world. The bag runs for $8,400 but it could be very well worth it with all the compliments you’ll be getting.